In science fiction writers is the theme that is quite literally been around for thousands of years; the alien invasion. From powerful gods waging war against mankind to usher in the end of the world to Martians initiating their conquest of our civilization and planet by landing in New Jersey, there have always been stories of mankind having to fight for our very survival against the vastly superior race that originated in the sky. This theme is incredibly easy to describe so immensely potential that can be expressed in every aspect of the course of the invasion to how we mere humans react, it is one of the most versatile themes found in the genre is conducive to constant reinvention. 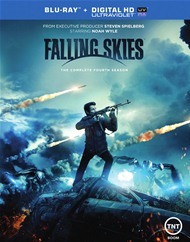 ‘Falling Skies’ is an entry to the genre by TNT network on basic cable. Some of the greatest examples of science fiction utilize this premise so rather high offerings featuring the conquering extraterrestrial. This series has made one of the better showings for this theme and its fourth season has been released in DVD and Blu-ray in preparation for its fifth and apparently last season. Many invasion scenarios have had allegorical ties to actual battle for freedom or prevalent views that affect the entire nation. What is undoubtedly unique about this series always connections to the American Revolutionary war. In the beginning of the show the correlation was over and integral to the unfolding of the story. It would be very difficult as well as stretching credulity beyond its breaking point to attempt to maintain the correlation that spans centuries. With the display of wisdom not often seen by television executives, this particular plot device was used to establish the world and populated with allies and antagonists. By this fourth season the main themes became a tapestry that included organic technology, genetic manipulation and the immense power of human emotions. In every war where people have to fight back against an imperialist force of vastly superior resources, a contingent of rebels, after experiencing devastating setbacks inevitably search for a place of refuge where they can re-gather, rebuild and regain their fervor to win. The band the survivors known as a second Massachusetts they have expended resources and lost lives to find such a place to be in Charleston. Such a place the relative safety is only to be short-lived. The alien overlords behind the invasion, the Espheni have a least a new mechanical soldiers known as mechs in the popular parlance, is unleashed upon the community. A new piece of alien technology is unleashed; giant pylons capable of establishing and will force barrier between effectively isolating Charleston from the outside world. As the shield is erected it divides the members of the 2nd mass into two groups. This is the excellent way to send a story into another television season. It maintains the familiar characters in the dynamics that have been built over the preceding three years while introducing a fresh approach to how the story is told. One part of the group will have to contend with existing in an enemy held motivation that is more secure the most prisoner of war camps. The other portion of the group decided between this the immediate concerns of freeing their comrades in using immobility to search for this is in the enemy taking a longer view to resolving the much larger issues. Tom Mason (Noah Wyle) was a history professor before the invasion but now he has been proven in the heat of many battles be a natural leader and resourceful strategists. Known by the aliens as being a dangerous opponent, he is placed by the overlords into solitary confinement. Rather than being broken by this isolation, Tom uses it to his advantage. He discovers a way to secretly come and go from his cell without being noticed. He uses his time outside to map out the current state of the streets and document enemy locations and strongholds. Tom launches a campaign of urban terrorism targeting the Espheni overlords, this slave race, the ‘skitters’ and the powerful mechs they deploy. Using a purloined motorcycle, his face covered by a scarf, also instills hope in the captive people by becoming an avenging vigilante. Comes vast historical knowledge has taught him at a small force, or even a single man, can become such a thorn in the side of the enemy that they will be forced to allocate resources to pursue him. Meanwhile on the outside the aliens have established a reeducation camp primarily targeting the captive children. One of Tom’s sons, Matt (Maxim Knight) is into such a camp and forced to assure compliance of the other children in this group. The camp resembles any call facility enforcing a strict hierarchy and unquestioned obedience to their doctrine base rules. The goal is to turn human children into a hybrid slave race which is the preferred modus operandi of the Espheni. Tommy befriends another prisoner were successfully escaped from the shield wall. The trick is to construct a wearable faraday cage to cause the legal charge to skirt around the wearer. While this is going on Tom’s wife, Dr. Anne Glass (Moon Bloodgood) is pregnant Tom’s child and is captured, taken to the mothership. Despite her consciousness being mostly impaired she can ascertain that she is being held by one of the Espheni in the human traitor and collaborator, Karen Nadler (Jessy Schram) performing some sort of procedure on her unborn child. It is a common practice in most television shows that contain a child character to rapidly accelerate the maturation but within the context provided here it is absolutely critical to the stories development. Anne’s child is born and in the course of a few episodes the child, Lexi (Scarlett Byrne) is a normal-looking human woman of about 21 years of age was main distinguishing feature is a stark white hair. Imbue some sort of power, Lexi stops a mech dead in its tracks establishing her place as a savior and supernatural leader. It counts brings up around her declaring itself to be a safe haven from any hostility. Lexi is virtually worshiped with Anne’s med student turned doctor, Lourdes Delgado (Seychelle Gabriel), becomes one of Lexi’s acolytes rapidly moving into the position of high priestess. The town, referred to as Chinatown, becomes a gathering place due to its growing reputation of neutrality. This also serves as the requisite plot point location to reassemble members of the group that have been separated. Tom, Anne and most of the others arrived just as Lexi embeds herself in a cocoon. The resident brilliant scientist, Roger Kadar (Robert Sean Leonard) warned that any attempt to extricate Lexi would most probably be lethal. The camp is divided with Tom and Anne, supported by Colonel Weaver (Will Patton) course of a wait-and-see attitude to determine if whatever emerges from the cocoon is actually hostile. Much of the crowd fired up by the perennial troublemaker, John Pope (Colin Cunningham) and one of the stalwart supporters of Tom, Maggie (Sarah Carter), demand a more prudent and proactive course be taken; execute Lexi or whatever happens to be within the cocoon. The series has maintained the vitality during its entire run to date and is sufficient threads to be resolved to ensure the next season will continue in kind. Success is predicated on a delicate balance between the actions generated by a ragtag group of humans opposing a vastly superior extraterrestrial invader in the personal stories that drive the character development affording the psychological pressures an opportunity to constantly instigate an ever-changing into dynamic of characters. Emotional content gives almost equal attention to the several long stories that are infused in the main story and characters that have become such objects of hatred that both characters within the story as well as the audience members truly detest the fact that such a despicable, opportunist person still exist but the human race on the verge of extinction.